KidWind Challenges are wind turbine design competitions for students. KidWind Project hosts the competition at events and online. The following standardized products make it simple to compete in a KidWind Challenge. If you’re entering a KidWind Challenge, either in person or online, and only need one set of equipment, then the KidWind Basic Turbine Building Parts and Vernier Resistor Board are the things you need. The Basic Turbine Building Parts kit includes the essentials you need to build a wind turbine, including a KidWind Hub, a generator, and dowels. You supply the blade materials, turbine shaft, and stand as well as the engineering design plan to build a wind turbine with the parts provided. Use the Resistor Board to test turbine performance with a multimeter or the Vernier Energy Sensor. Great for STEM classes and NGSS integration. If you have an entire class competing in a KidWind Challenge, then you need the KidWind Basic Turbine Building Parts (10 Pack) and some Vernier Resistor Boards. This setup provides enough KidWind Hubs, generators, and dowels for 10 groups of students to design and build wind turbines. The number of Resistor Boards you need depends on the number of test stations (fans) you have. You supply the blade materials, turbine shafts, and stands. 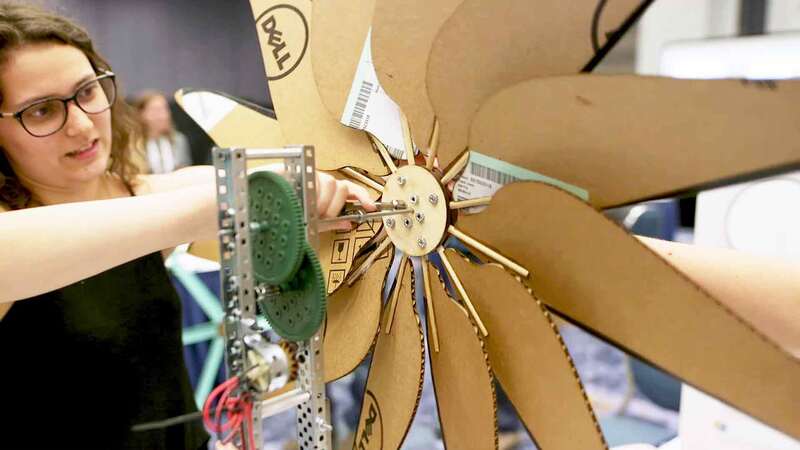 KidWind Challenges are hands-on wind turbine design competitions for students. The challenges are event competitions or online competitions.